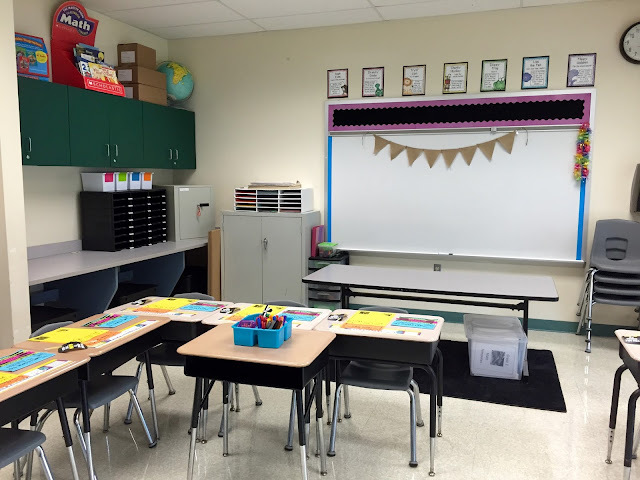 Back to School, Classroom Reveal, and a FREEBIE! Happy back to school to all of the fellow teachers and parents out there! Back to school is PRACTICALLY a holiday... right? (With all the money I spend around this time it should be!!!) The teachers in my county just started back on August 25th and the students will be joining us August 31st! Our open house was tonight and I left with a HUGE smile on my face! I have some of the sweetest and funniest kiddos in the world and I can't wait to see them learn and grow this year! I have a total of 22 students this year and 12 of them showed up to open house (four times the turn out I had last year!) 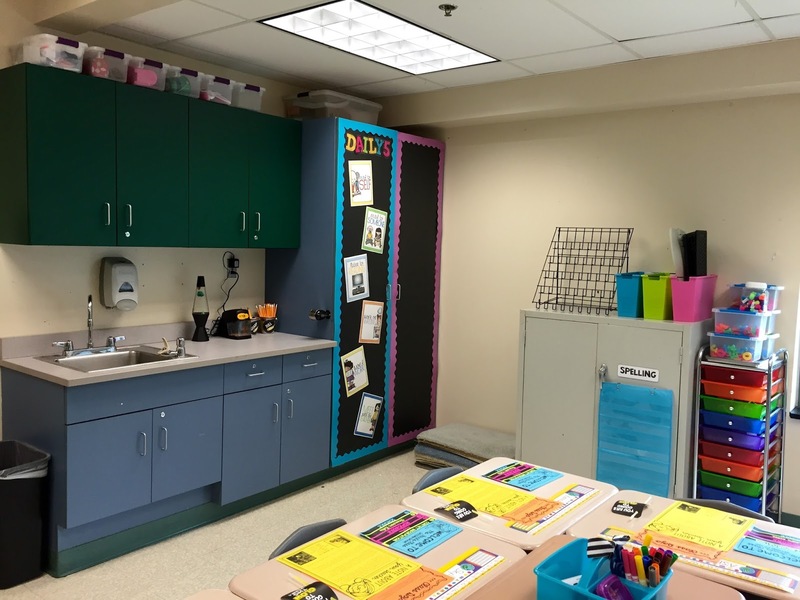 Considering my room was just about the cleanest it will be all year, I figured this would be the perfect time for a classroom reveal! My room is DEFINITELY on the small side! It isn't perfect yet and I still have a lot of improvements to make, but it's a good start for the beginning of the year! 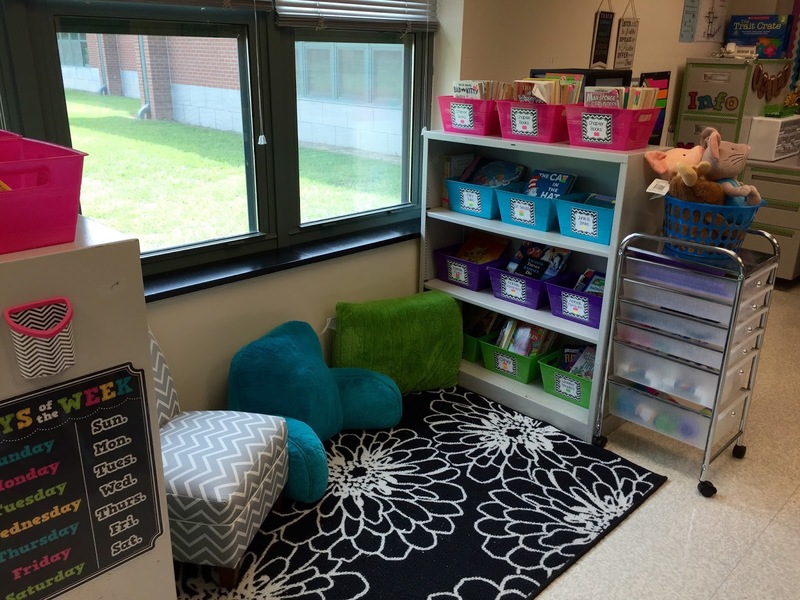 Here is the area right by the door and one of my favorite spots in my room! 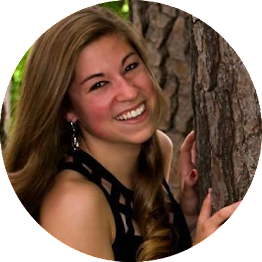 The job chart is by Amy Groesbeck and can be found here! Each student is assigned a number and they are attached with Velcro! 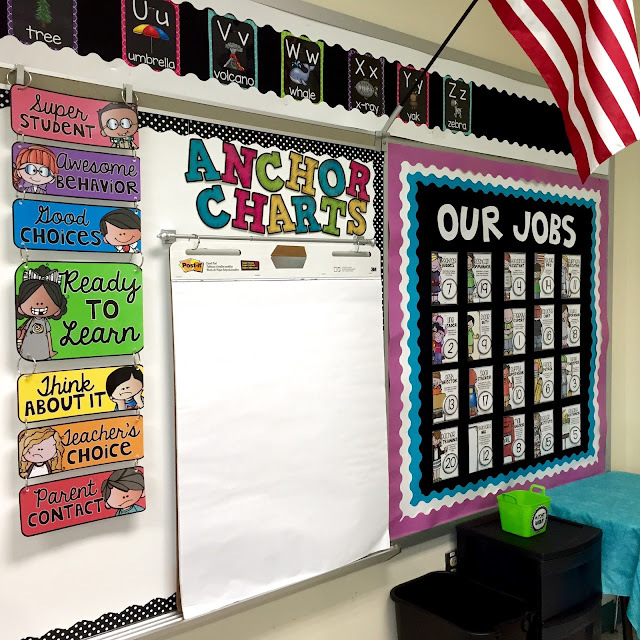 This year I have opted to hang my anchor charts on a magnetic curtain rod I found at Walmart for only $8.47! The behavior chart is by Learning in Wonderland and attached together with book rings! The alphabet is part of the Black and BRIGHTS collection and is available in my TpT store! 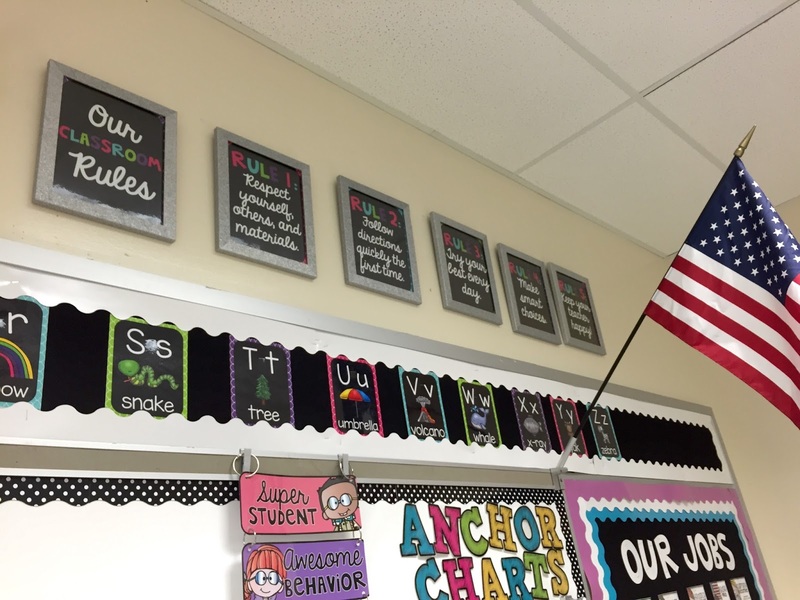 Here are my VERY crooked classroom rules! They are also part of my Black and BRIGHTS collection in my TpT store! 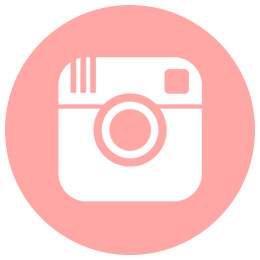 Editable rules are included!! This is my desk area! 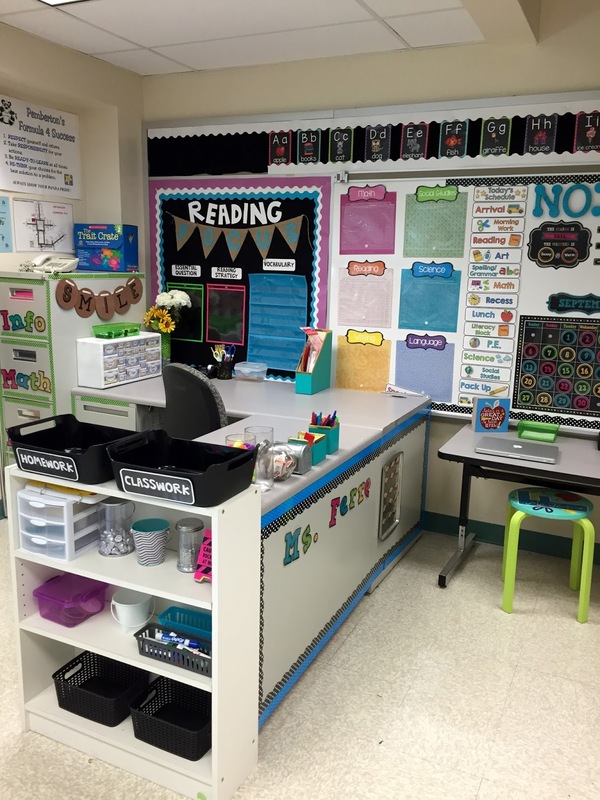 I am oh so envious of the teachers who have been able to get rid of their teacher desk! I personally spend a lot of time after school at my desk doing work and have not quite been able to make that transition yet! This is the left side of my front whiteboard where I post my objectives and schedule! I have all my standards and objectives typed up and stored in a binder. Each morning I put the coordinating standards and objectives paper in the page protector for each subject! I use the "NOISE" magnets as a classroom management tool for maintaining an appropriate level of noise in my room! How it works... the students start out with all the letters posted. If the class gets too loud, I remove one letter at a time from the end of the word. After 3 strikes, only "NO" will be left on the board which means NO MORE TALKING! 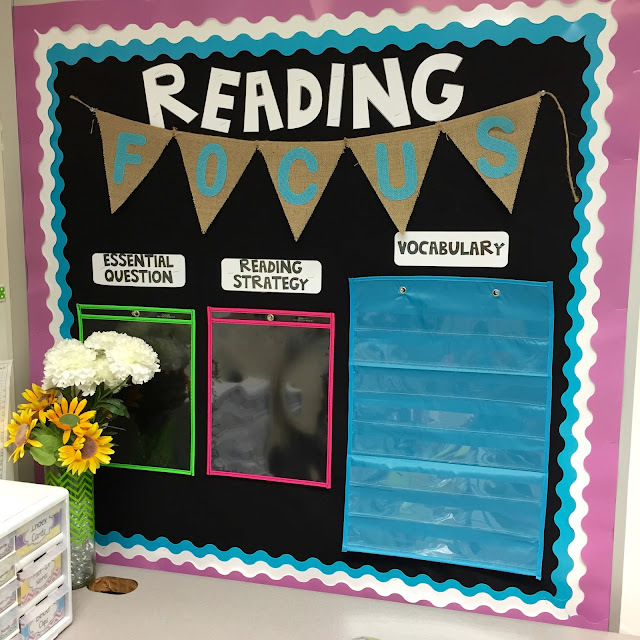 This is my reading focus bulletin board where I post vocabulary, reading strategies, and our essential question! 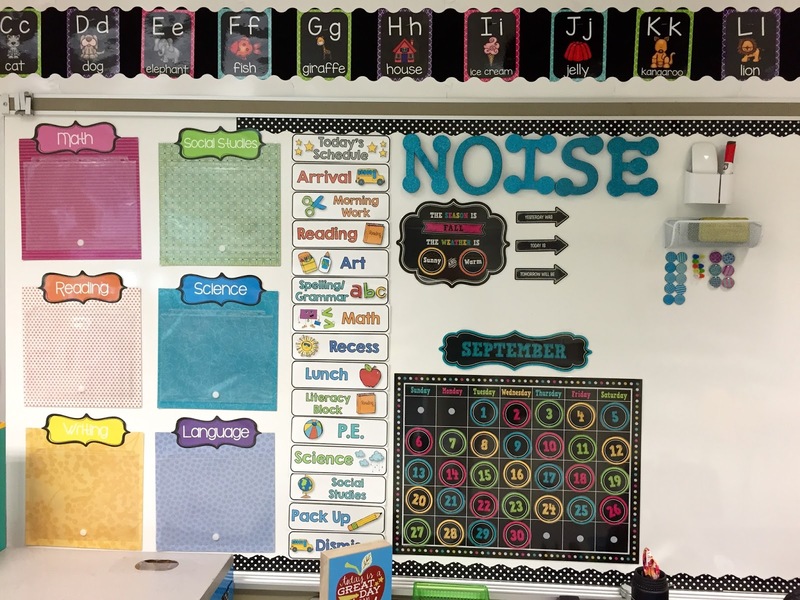 The burlap bunting and letters were found in the Target dollar spot along with the blue pocket chart! I was inspired by Amy Lemons to jazz up my filing cabinet with some magnet border and letters to label what's in each drawer! BEST IDEA EVER!! 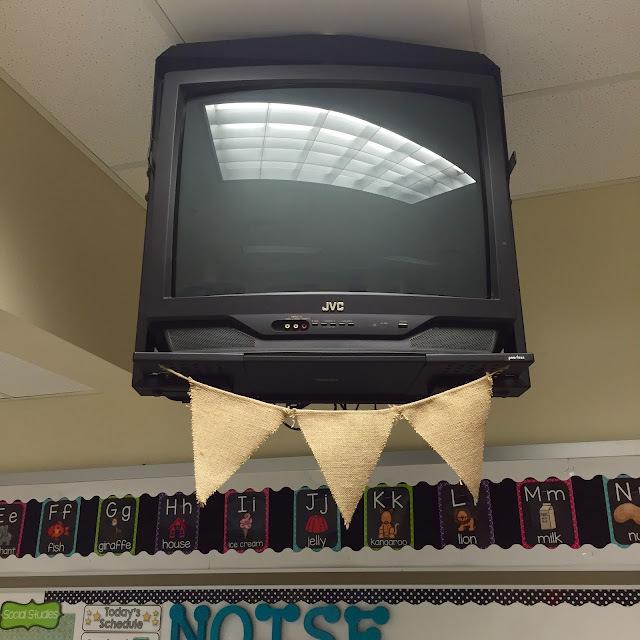 I had to cut the burlap bunting to fit on my reading focus bulletin board so I decided to hang the rest of the bunting on my TV! 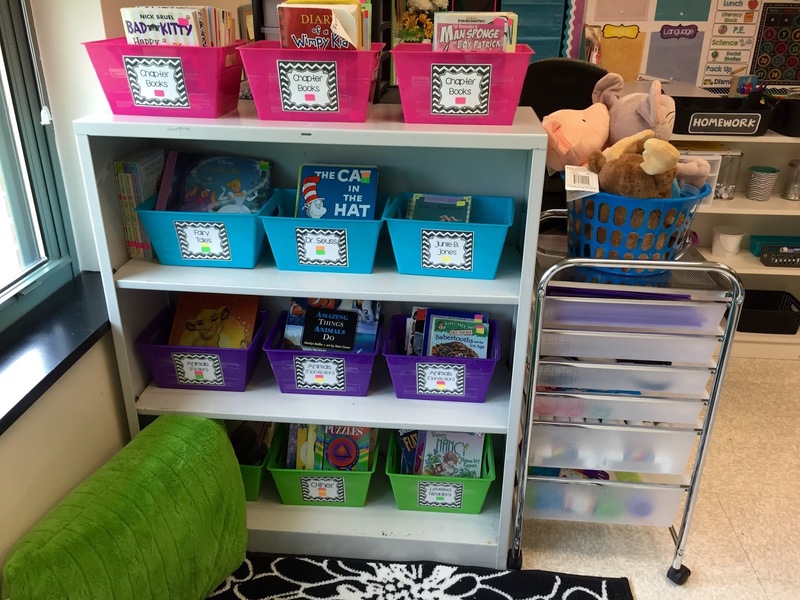 My classroom books are labeled with a colored sticker that corresponds to the label on the bin it belongs to! 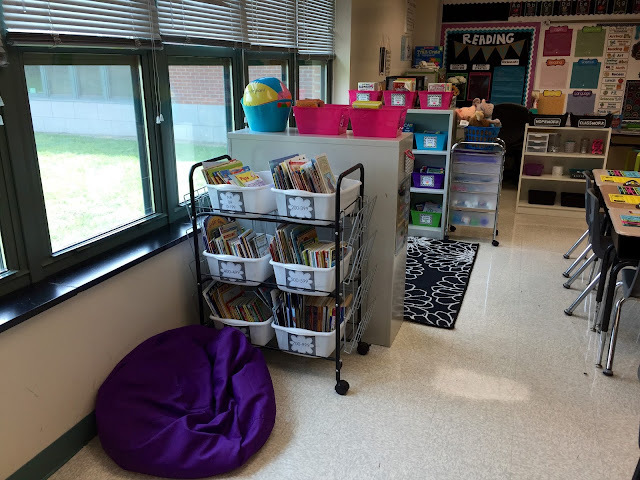 My classroom library continued! The books in the cart are al books that are provided by my school! Such a BLESSING! The back corner of my room! 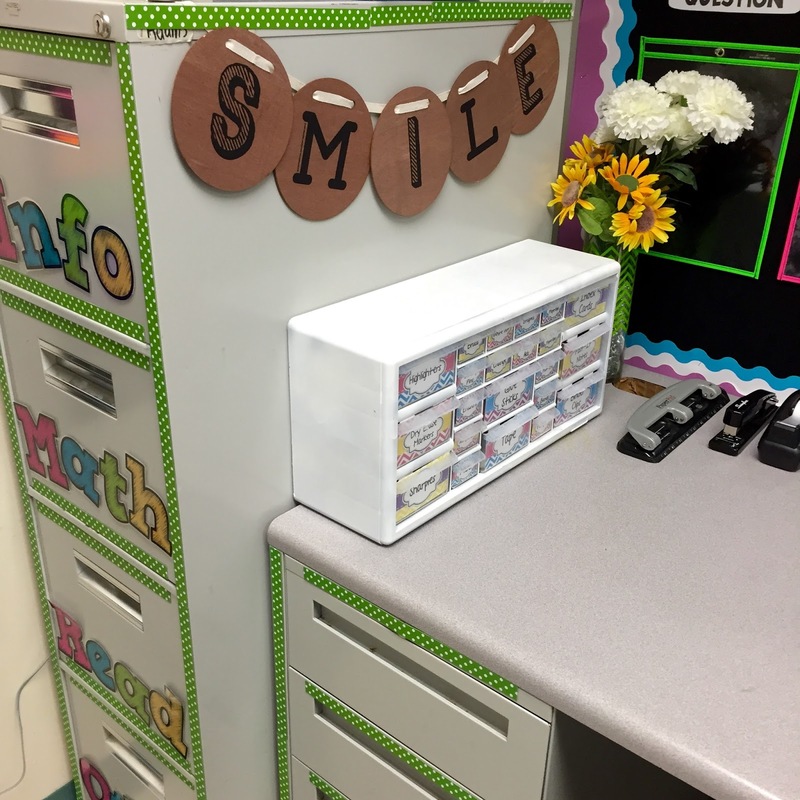 The rainbow cart holds all my word work activities... magnetic letters, keyboards, stamps, etc. 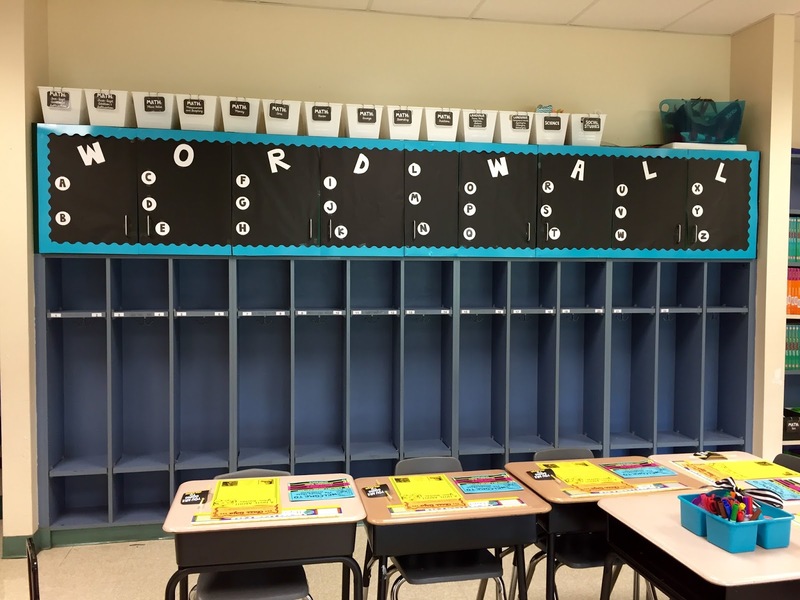 The weekly spelling words will be displayed in the pocket chart. The clear bins on the top of the cabinets hold my holiday activities... I still need to make labels for these! The other back corner of my room! 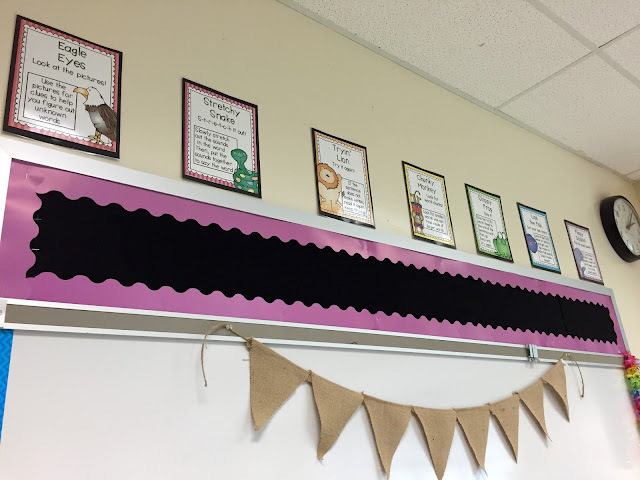 I love these reading strategies posters! 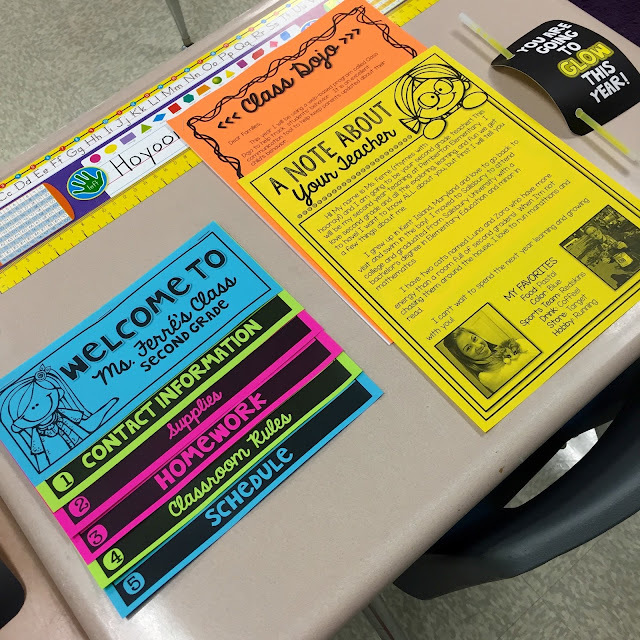 They are perfect for students to reference during guided reading! My makeshift word wall! I already have the words I plan on posting printed, laminated, cut, and stored alphabetically in an index card holder. Here is the view inside of one of my cabinets! These are all my extra crayons, markers, and glue! (Trust me, it won't look like this at the end of the year!) The white bins above the cabinets hold all of my cards and activities that I have prepped! Here is one of my groups! 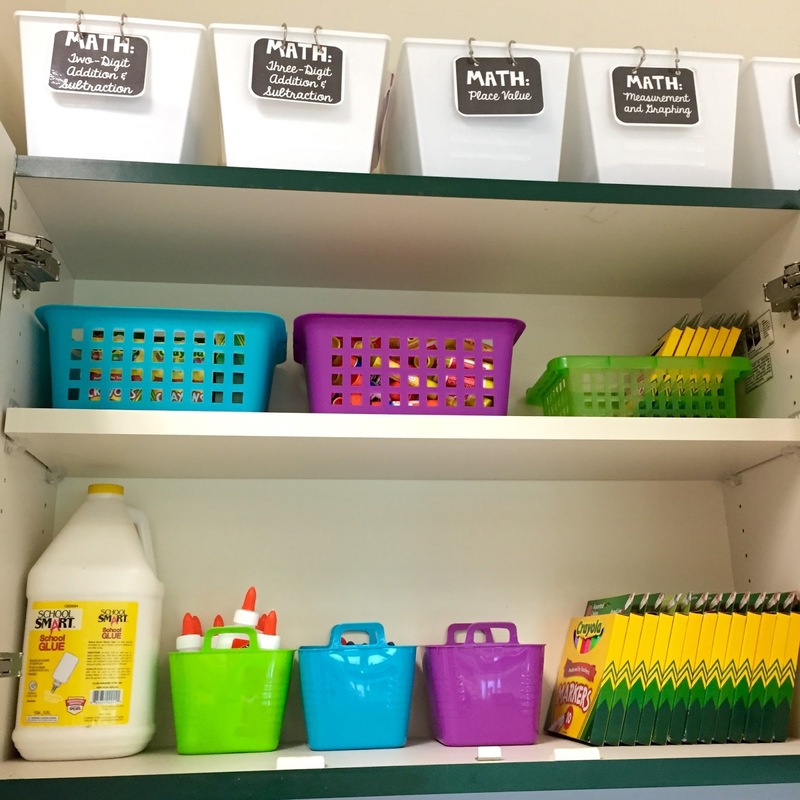 I absolutely LOVE using the caddies to hold group supplies such as crayons, markers, scissors, glue, and dry erase markers! I also store reading books inside the desk. Ugh, that one desk still needs to be lowered! I am hoping one of my lovely janitors will have fixed that for me by Monday! Here is another one of my groups! 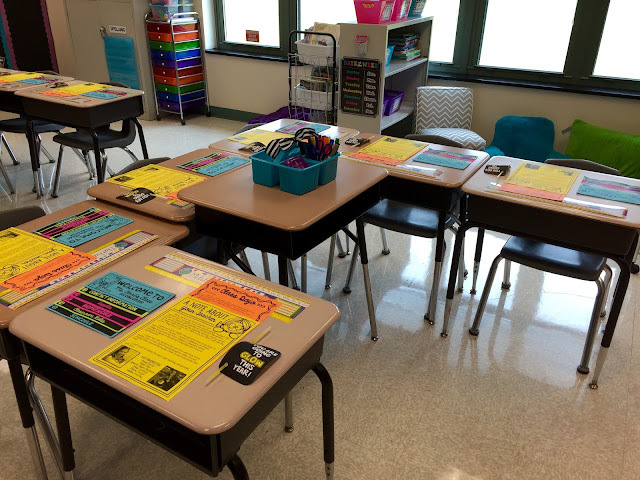 They are all slightly different because I just added desks as students were added to my class. This was my display for parents for our open house! 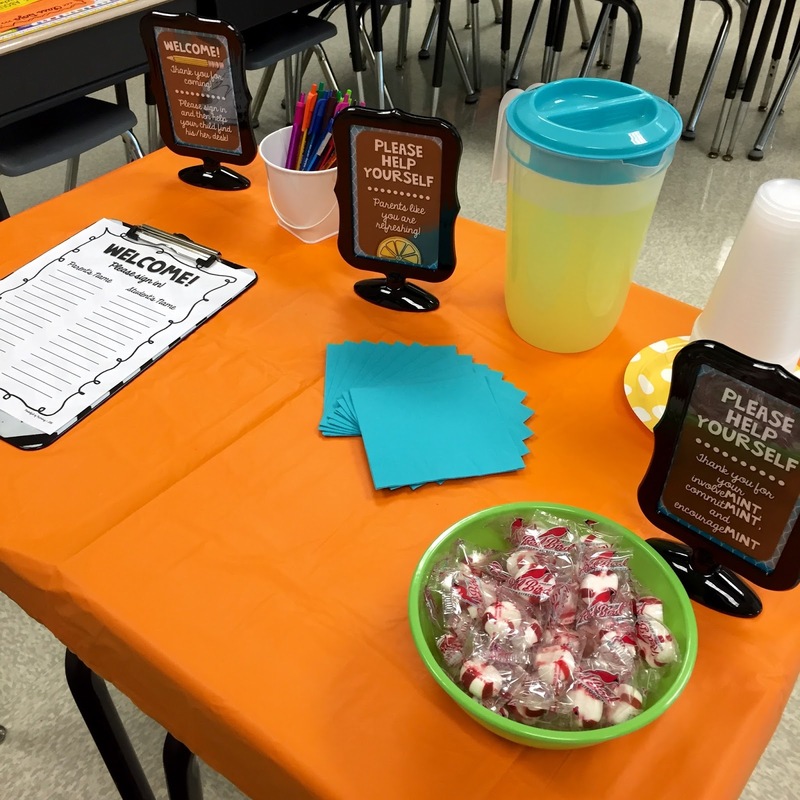 The sign in sheet is part of a freebie in my TpT store!!! Let me just say... the lemonade went FAST! It was super hot in our school because our air conditioner hasn't been working correctly. Lemonade was the perfect solution! The kiddos loved the mints! 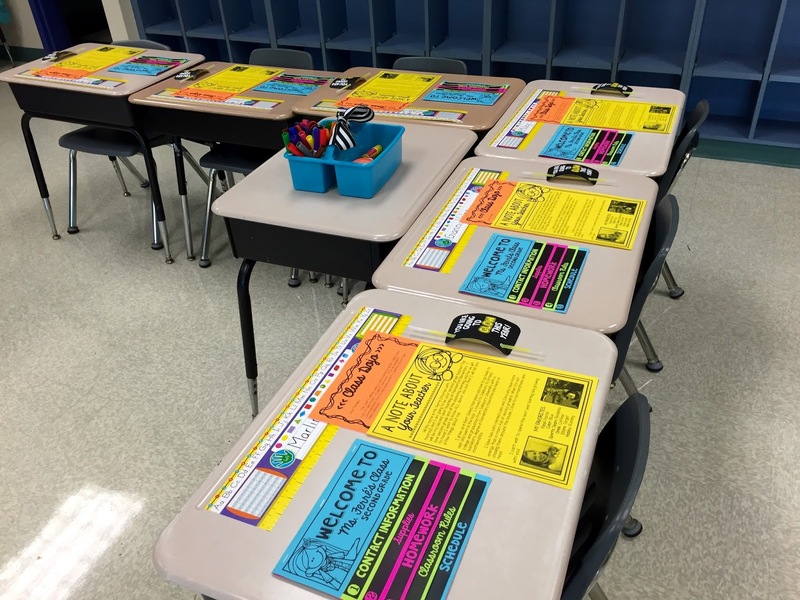 Here is a close up of my students' desks for open house! The flip book is by Learning in Wonderland and I HIGHLY recommend this to anyone! It is double sided so there is NO cutting! Just print, fold, and staple! As a thank you for stoping by... 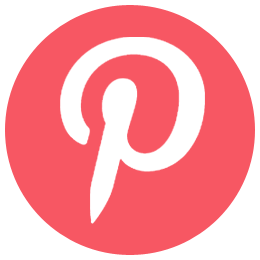 I have included the glow stick tags as a FREEBIE! I included several different colors so you could match it to the glow stick color! I hope everyone has an amazing beginning of school!